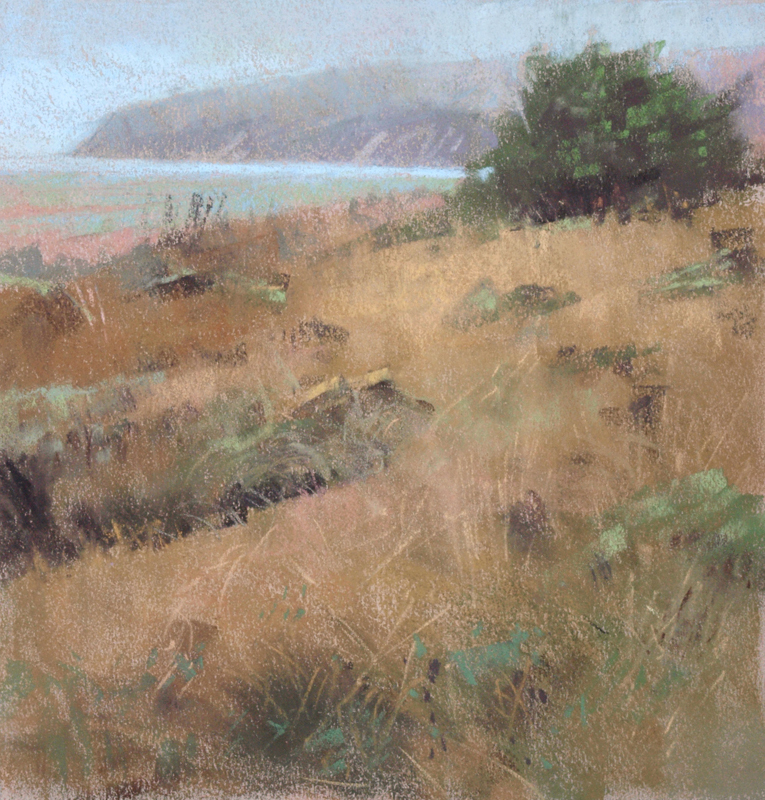 I taught a 2 day workshop for 14 participants near Limantour Beach a few weekends ago, hosted by the Point Reyes National Seashore Association. The bulk of the class participants stayed at the Clem Miller Center, just down the road from the youth hostel, while a few stayed outside of the park, and commuted in every morning. I was prepared for a foggy overcast weekend, but was surprised to find plenty of sunshine on both days. Here's a few pictures with notes about how the weekend went. I drove up around noon on Friday to do a little more scouting out at Pierce Pt. Ranch, as I felt we might paint up there on Sunday if there seemed to be a shortage of things to paint where we were situated. It certainly turned out to NOT be the case. I did two studies up there for future reference, one under the gaze of 2 Tule Elks seemingly crouched in the foliage a few hundred yards away. 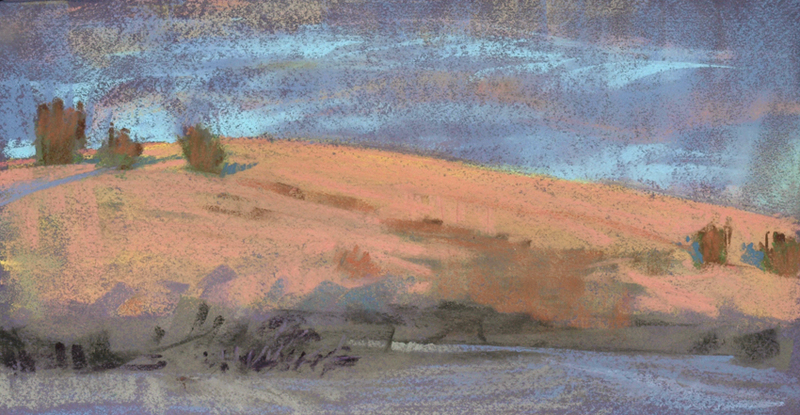 I drove back through Inverness and out towards Limantour. The image above was the underside of a windswept tree on the property of the Clem Miller center. This was around 4:30 on an overcast afternoon. One of the assistants showed up from a run while I was painting, unlocked the dining center and classroom, and we looked things over. I put up some examples of my work and made sure the projector was working, while Marishka put out a cheese plate, and I opened up some wine. Folks from the class started arriving around 5, pulling out snacks and we had a nice evening, meeting new people, and revisiting some who had taken other workshops with me. I went out early on Saturday and scouted around the beach a bit. It was clear and sunny. 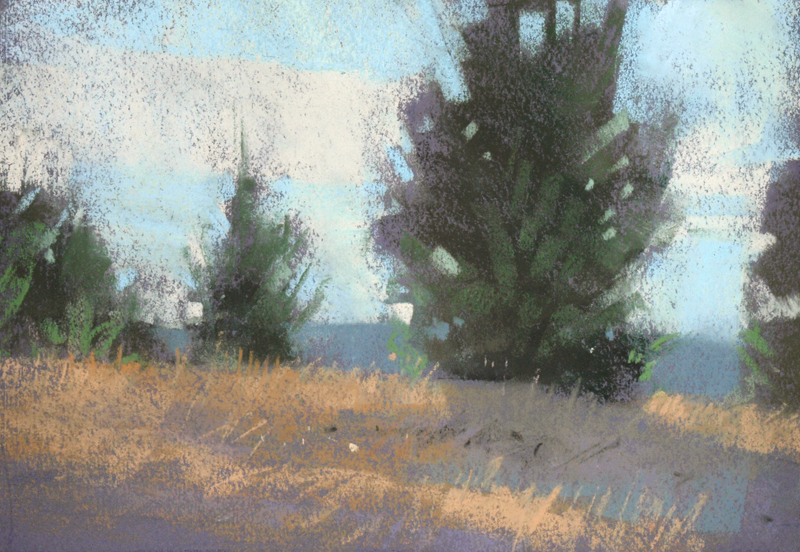 There's a variety of elements and views to paint, but I picked this view of bishop pines as my first demo to give the class the sense that the 'unremarkable' sort of views can have as many interesting challenges as the iconic (and more difficult) ones from the same viewpoint. Back in camp for lunch and lectures, I did a few more demos in the afternoon. This is the second one, looking into a wooded hillside above the road. Late on Saturday, some of the class went back to the beach, so I went down there with a few others a bit later. There were some crazy undulating clouds drifting over, with holes between them. 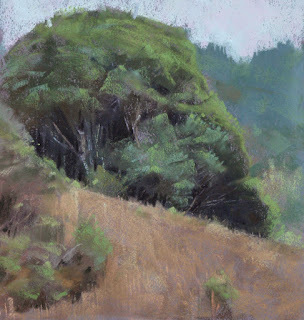 I had left my easel and main box of colors in camp, as I was intending to do walk arounds, but we couldn't immediately find the others, so sat in the parking lot and went to work, chasing the light up the hill. Intense warm light slamming into a hill of dead grass can turn green objects practically into orange. Against those clouds, it was over-the-top color, but fun to try and get it in paint, as the shadow relentlessly rose upwards, squeezing orange to pink... Other folks from class appeared almost magically, some on the road, pulled over to paint, some walking down the hill, all as if drawn by the strange clouds and colors. An amazing sunset to witness. We had a potluck that evening that was an absolute feast. Artists know how to cook and eat well! Sunday morning was foggy, which gave us a change of palette and values to explore. Here's another view towards the estuary with one pine, and a lot of grasses coming up to the foreground. One interesting thing I noticed is that this kind of light can be reproduced in a sort of 1:1 correspondence with pigment. It is not so intense as to exceed the value range of the medium of paint or pastel. In bright light we are compressing value immensely to express that brightness, but it is different on a day like this. 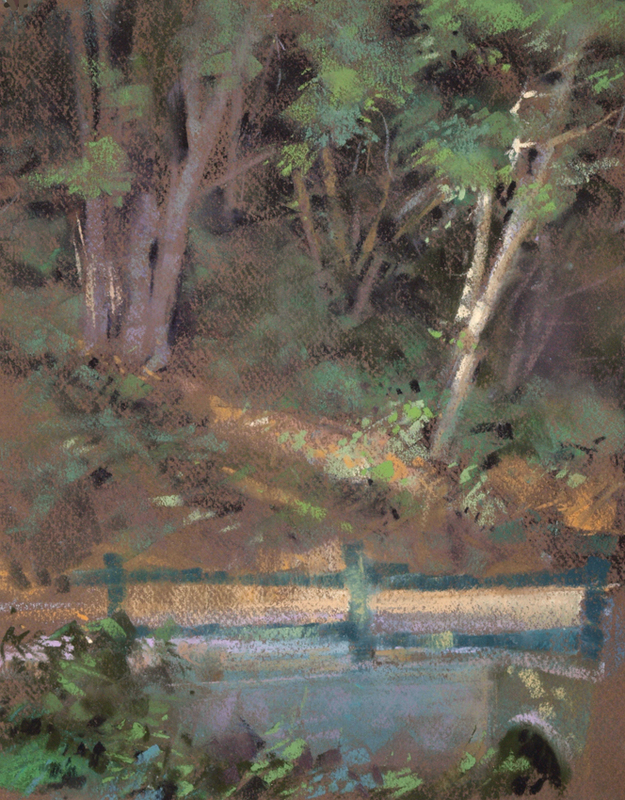 Maybe that it is an obvious comment to many, but it was a new discovery for me, as I haven't painted in this type of light very much. 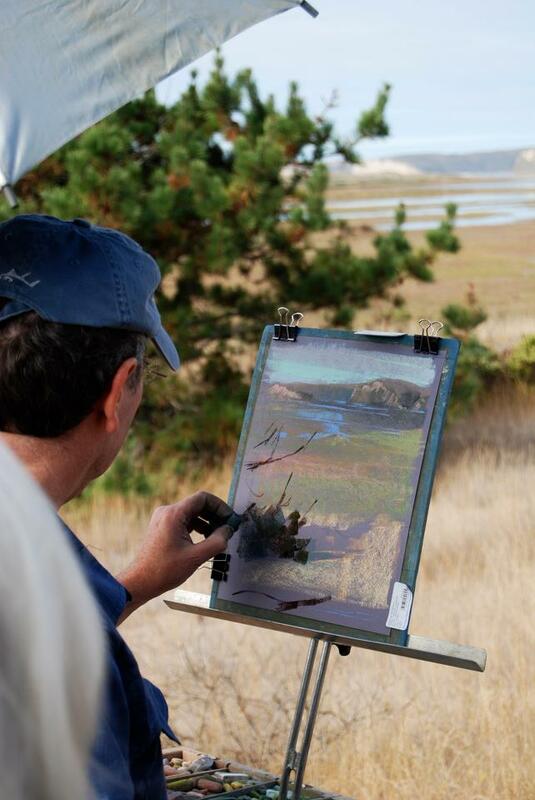 Here I am doing that demo, and you can see the value range on the ground is close. Ok, the sky is blown out in the photo, I admit. My umbrella is up, because a mist of drizzly stuff was landing on my paper..
We painted until noon, as I made my rounds, seeking out participants on sand dunes, the main trail, and one individual way out on the edge of the marsh, whom I spotted through a pair of binoculars. We returned to camp for lunch, a final crit, and then to clean up and say our goodbyes. 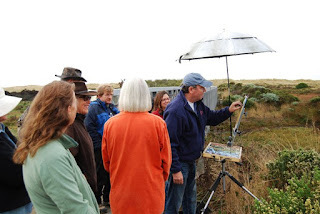 I really enjoyed the group, and the location is full of things to paint. I feel we barely scratched the surface. As a result, I'll be teaching another 2 day workshop out there in the spring. Stay tuned. Thanks to Arden Johnson for allowing me to use her photos, the 2 assistants, Marishka and Janet, and my gratitude to everyone for bringing so much talent, energy (and great food) to the workshop. Wonderful account of a really good looking workshop, Bill. I love your comp's in this different , not real wooded place----These workshop goers were so lucky to see you work. This looks like a great workshop. I wish I lived in the area. I would be interested in yaking the workshop and exploring the park.